What are you waiting for? Get on LinkedIn and start growing your business! You don’t need to be on every social site out there because let’s admit, it can be overwhelming. You need to be spending your time doing what you were born to do. Staying in your zone of genius. And that is running your business! But on the other hand, marketing is necessary to grow your business right? I want you to be getting the biggest return in the shortest amount of time, and the perfect way to do that is through LinkedIn! 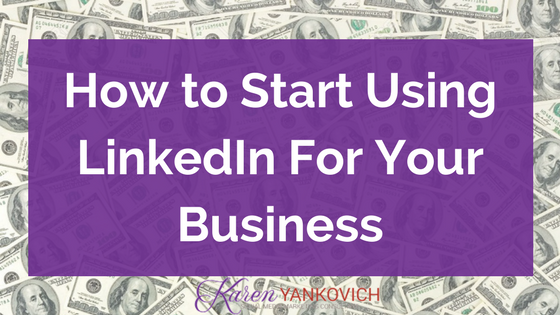 Follow these few steps on LinkedIn and you’ll be on your way to business success! It is essential to anything you do on LinkedIn. If there are holes in your profile, no picture, no business link, you can’t expect it to make money for you! There are 3 things you need to do when you start updating your profile and I can tell you all about them here. Go ahead and complete your profile with these 3 basic tips, it only takes a few minutes! Let’s be honest, if you’re not on consistently or leave LinkedIn for days or weeks at a time, people forget about you! Keep sharing business updates; keep connecting with people; keep engaging in your LinkedIn groups. People will notice and eventually will want to know more. Connect with Everyone you Meet! I can’t express enough how important this is! You may meet some of the most valuable connections in the world, but if you can’t get in contact with them afterwards, it’s pointless! You may get a business card, which is great! But they only have their phone and email, that’s risky. They can either ignore your call, forget to call you back, or your email can get lost in the inbox! Go ahead and connect with them immediately after meeting! You will have their profile forever and you’ll stay present in their feed; aka, top of mind! This goes hand-in-hand with connecting with everyone you meet! Having a consistent outreach not only keeps you top of mind, but shows your connections you care! It could be as simple as asking how that project they were working on is going! Make some notes, keep track of what they’re doing and check in every now and then. This is all VERY easy to do! Takes about 20 minutes a day and you’ll see MASSIVE changes in your business! Want some help? Join the LinkedUp Revolution and get 21 days FREE of in depth Linkedin training!